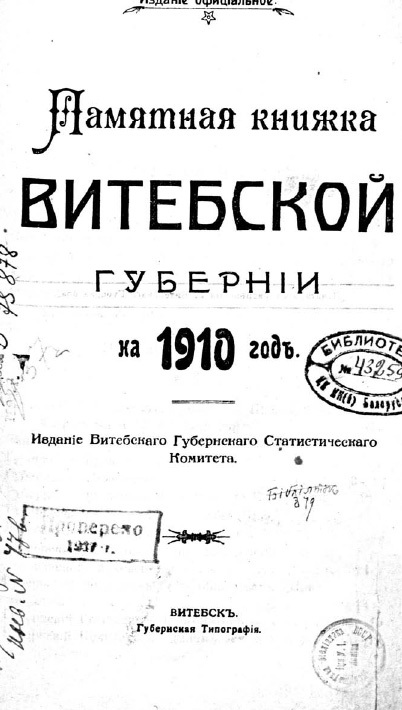 Commemorative book is the official reference yearbooks produced in 89 provinces and regions of the Russian Empire from the mid 1830s until 1917. Produced by local officials and bodies of internal affairs. Currently Commemorative books are one of the most valuable sources of information on the provincial history, an important source of genealogical information along with sources such as the Provincial Gazette, diocesan sheets, reviews provinces, the works of provincial scientific archive committee, lists of the nobility. Commemorative books you can get information about the composition and occupation of the inhabitants, the state of nature, economy, culture, way of life; observe the changes taking place in the county or area year after year, for more than 60 years. - Scientific and local history collection (source study, descriptive, research, and bibliographic materials archeographic). All these elements give the memorial book of exceptional value and importance of comprehensive primary sources for historical (including genealogical and biographical), geographic, demographic, ethnographic, natural history research.